Meet our Amish Quilter Naomi B - Naomi B lives at the end of a curvy lane with her large white farmhouse set against a backdrop of trees sloping down the mountainside. 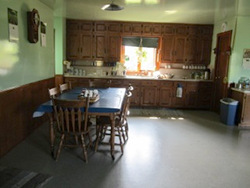 Her Amish home is among a small group of other Amish homes. When we need to contact her - we either stop by or write a letter/note and wait a week for the reply. Joseph and Naomi farm this quiet spot in Pennsylvania where the valley touches the hills, and once a week (after spring time) he sends salad greens and vegetables down to Washington DC for restaurants in the city (that is is main source of income). Naomi greeted me at the door the other day with a huge smile, because the quilt she was working on is completed, and she saw that I had another custom Amish quilt in my arms ready for her to work on. This is what Naomi does, she quilts full time, that is until the first little one arrives, so for now she is busy working and saving for when the money will be really needed. Although Naomi quilts full time, that doesn't mean that is all she does, she also cans, bakes her own bread (on a keroscene fired stove), makes both her clothes and her husbands clothes and much more. Naomi B is Old Order Amish. 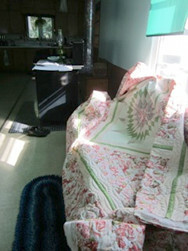 It's the end of January, and I just dropped of Gerri's grandmothers antique quilt top to Naomi for her to quilt. 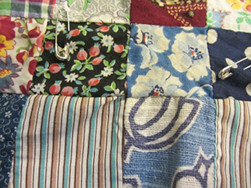 What a fabulous collection of old feedbag fabrics, all sewn by her Grandma into a postage stamp quilt. 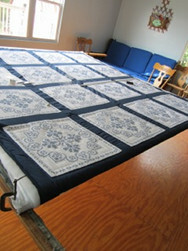 We had to reinforce over 80 seams just to prepare it for quilting! Naomi is due the beginning of April, so she just glowed with happiness! 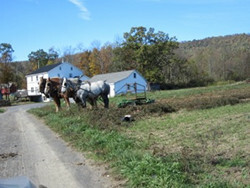 and Joseph, her husband gave a cheery smile & wave as he was leaving the barn to complete his chores.